On Friday, July 11, we arrived in Pigeon Forge, TN around noon. The temperature was in the high 90s and very humid. After visiting one of the local car washes, we fell in line with several mini-truckers and headed up the main drag. Pigeon Forge's main drag is 6 lanes wide with grass/turn-offs in the middle. Mini-trucks were everywhere. Different clubs lined the yards and sidewalks in front of the hotels they were staying at. Everyone else was either cruising or parked along side the main drag. We soon discovered that the back streets were as full of minis as the main street. The number of mini-trucks in town was awesome. Too many to count. We cruised among the best. It took us 1 hour and 15 minutes to go 2 miles. The Mini-Truckin' staff was on-hand by the road side. Hydraulic demonstrations and burnouts occurred in the street in front of the Mini-Truckin' staff. Stripes, wild graphics, air bags and performance items were the main focus. 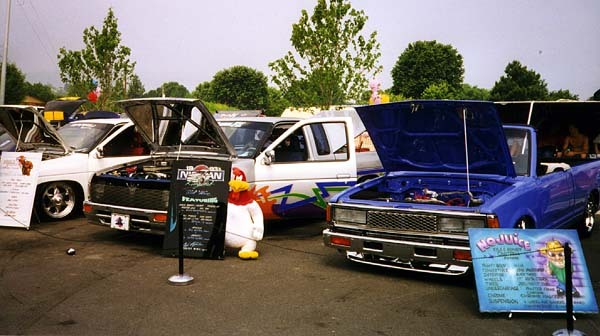 All pictures are © Copyright 1997 SporTruck Web Page. Images not to be reused without permission.